I like this draft very much, because it properly explains the shift in fashion points from the older bulky style of the 1950's into the slimmer 1960's. Each change is not only listed but the following text reminds you where the change is occuring as you perform the draft. The translation is presented once again as for Private Study Only. I would encourage anyone interested in this art to check Mueller's current publication list. They are still of excellent quality. Thanks again for Peterle in checking over my translation. 2. A noticeable waist effect is present. 3. It is enhanced by a looser hemline. 4. The Waist and the button closure some a bit higher. 5. The side pockets shift slightly upwards. 6. The Shoulder Width is smaller. 7. The Armhole seam runs straighter. 8. The Armhole area is more sophisticated. 9. The transition to the Sleeve is more accented. 10. The Jacket Length is somewhat increased. 11. The Collar begins to rise earlier at the side. 12. A full sleeve part completes the silhouette. 13. The longer back is accented by longer side-vents. 14. The armhole lies relatively higher. b) The Jacket length is calculated a bit larger. e) The armhole is higher. T-G The Seat depth = ⅛ Kg. The Back width can be kept ½ cm slimmer This will reduce the easing fabric that accumulates towards the armhole (aka. Rollweiter - Drape). Rb- Square up (vertically) to b [not marked in this draft]. The waist effect is supported by a looser hem. Therefore the back can be left ½ to1 cm wider in this area. This extension is added additionally. With side vents it is absolutely necessary. a2-g Draw a guide-line, use it to form S and t1. S1 = Set the seam width ¾ cm inwards, draw out the armhole. The chest width is a little smaller, we have taken 2/10 Ow + 3 cm. f/e1 Apply a tailor’s square along this line, meeting up with Ad, draw a horizontal guideline forward, form H1. The armhole width/diameter can also be a little narrower, although this comes at the expense of the sleeve width. At a, 2 cm is removed from the side dart. Because the addition to the armhole width is only 1 cm, the missing amount of 1 cm is replaced by shifting the side seam at the back r-r1. G5 - Find the amount G1-G2 from the back on your tape measure . . .
G4- . . . match it with G5 and measure to G4. It should equal ½ the seat width + 7,5-8,5cm ease. H1-h1 Lapel crease line = 2cm. 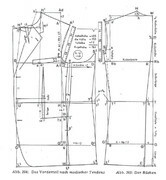 Crease line, Lapel, chest pocket, side pockets, button placement and further details see drawing. I like this work! Clean and approachable. The only thing I don't like, is for certain operations, they refer you to to Claire Warginer's series "Details De Mode a la Loupe" which are based upon factory short methods. Other than this, it is a valuable resource. Shrink is to make smaller using water and heat (with natural fiber cloth). Stretch is to make larger using water and and heat (with natural fiber cloth). A heavy hot iron is used to encourage the shrinking or stretching. I will print them out and do practice with the cut pieces in my hands, I will figure it out , I am sure. I do this to lady's pants as I was taught, except, I do not know properly where to "shrink" and where to "scratch" now I can follow the pictures. I will leave the translation in English then. I have put together a little glossary, and there are explanations in the text. Any problems post a question. What I miss is that I cannot understand what he is teaching. I learn a lot of how to make it with a professional traditional master workmanship. The Apprentice's Forum / Re: Professional waistband of a men`s pants. Mmmm, I learned that there are pros and cons now,otherwise I will make a mess - baking without a recipe...disaster! I think I will stick to the shore bought instant ones is a bit safer. Modern science makes life pretty good. Thank you for sharing your experience, very much appreciated. Schneiderfrei, I am a Chinese. I immigrated to Canada from Hong Kong. I have no problem of daily English. When I read the instruction, I cannot understand completely. I am trying hard to practice more by reading all the replies to learn more. Some verbs are hard to identify its actual action, I am not able to tell what to do, that is why I need videos to help. I am sorry I am not at all demanding. I wouldn’t try this on a poly /viscose from south east asia... But dressage works perfect on good cottons and linnens, also blended. I once learned that (in colonial times...) Linnen were shaped when totally damp... And that tropical cotton uniforms and wear were canvassed with linnens, does anyone know anything about that?